The Ricoh 1515 is a very compact and space-saving desktop copier offering professional image quality monochrome - black and white only - laser printing. As it only weighs 52.91 lbs, it is possible to house this module in a special cabinet (which is offered as an extra). This modular console is suitable for home use or for small offices, medical practices and the like. The standard version is sold with three optional configurations, offering the buyer the choice of customising the copier in such a way as to result in a perfect solution for his needs. 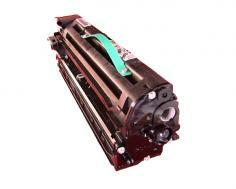 It is also equipped with automatic duplexing and the ‘scan once, print many’ feature. It is extremely easy to operate via its intuitive control panel. In order to upgrade this console to multi-function ability, scan to e-mail, network printing, scanning, G3 faxing, internet and LAN-faxing configurations are offered as optional add-ons. Once upgraded, the Ricoh 1515 eliminates the need for separate coping, printing and faxing systems, thereby saving on both cost and space, as the basic unit is only a very small 18.43" x 17.72" x 20.12". The upgraded version uses a standard 16MB memory - which may be further upgraded to192MB - and is run on a 120V/60HZ power source. This unit comes with a standard 30 page automatic document feeder, a 250 sheet internal paper tray and a 100 sheet bypass tray. A 500 extra paper bank is available as an optional extra. 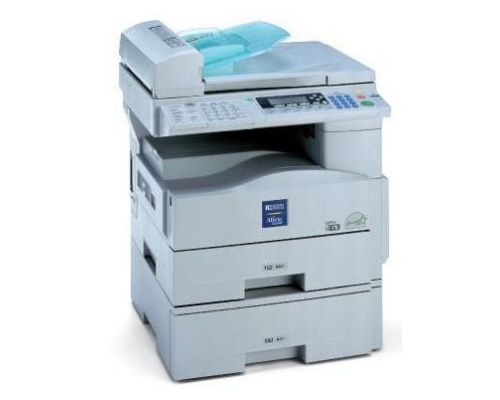 A3 is the largest paper size which may be used in this copier. The maximum weight and quality of paper accepted is 16-24 lb Bond for the paper tray and duplex printing; and 14-42 lb Bond for the bypass tray. It is possible to increase the paper capacity to 850 sheets, also as an optional extra. The unit prints and copies at a rate of 15 pages per minute (ppm); at 600 dots per inch (dpi); and with a 256 grey scale level, thereby producing very high quality results. It allows both automatic and manual exposure adjustment and is capable of printing on both paper and transparencies; together with envelopes (which are processed through the bypass tray). 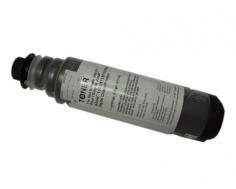 The Ricoh 1515 takes only 15 seconds to warm up from idle, thus contributing to a reduction in waiting time and energy saving. Thereafter, the first page will exit the machine in less than 7.5 seconds. This copier makes use of laser beam scanning/marking and electro-photographic printing. The ‘scan one, print many’ feature is an aid to productivity, as it is able to scan an original into its memory and then print it (22 ipm at 200 dpi) as many times as necessary, thereby saving wear and tear on original documents; time and money by less use of the feeder and scanner; and less risk of jamming and malfunctions. It is also possible to combine more than one original for copying; and to copy both sides of a document. There is an electronic sorting function which eliminates the need for a separate sorter or for time consuming manual collation. Also standard is the automatic enlarge or reduce feature with 5 preset modes, zoom mode and the automatic duplexing facility. Optional features of the scanner system include an embedded scan to e-mail function, TWAIN network scanning and Ricoh’s ScanRouter V2 Lite software which works at 22 ipm at 200 dpi, all of which are supported by TIFF, Multi-Page and PDF files. The Ricoh 1515 is very reasonably priced and cost effective. It has an energy saving mode and is extremely easy to operate. As this a very small machine with limited functions, it is only suitable for home or small office use. In order for it to become a multi-function unit, many optional extras are necessary, so it may be prudent to look at larger copiers which have these options as standard features. Review it: "Ricoh Aficio 1515 "
The Ricoh Aficio 1515 uses a black toner cartridge, the 230gm option of which is able to print 7,000 pages at 5%. This cartridge is also available as a 6 pack. The developer need to be replaced every after 60,000 pages.